On April 29, 1909 Otto Tiedt received Deutsches Reich Patent 222527 for Doppelblechblasinstrument, entstanden durch Vereinigung zweier Instrumente verschiedener Stimmung in einem Instrument (Double brass wind instrument, created by combining two instruments of different keys into one instrument, diagram above left). 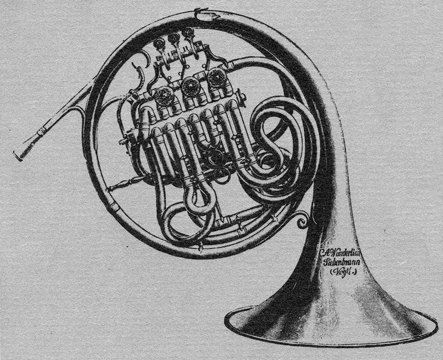 2 This a full double horn with three single valves and one eight-story ("Walzen") change valve, operated by the thumb. The single valves are connected to the change valve through six parallel tubes. 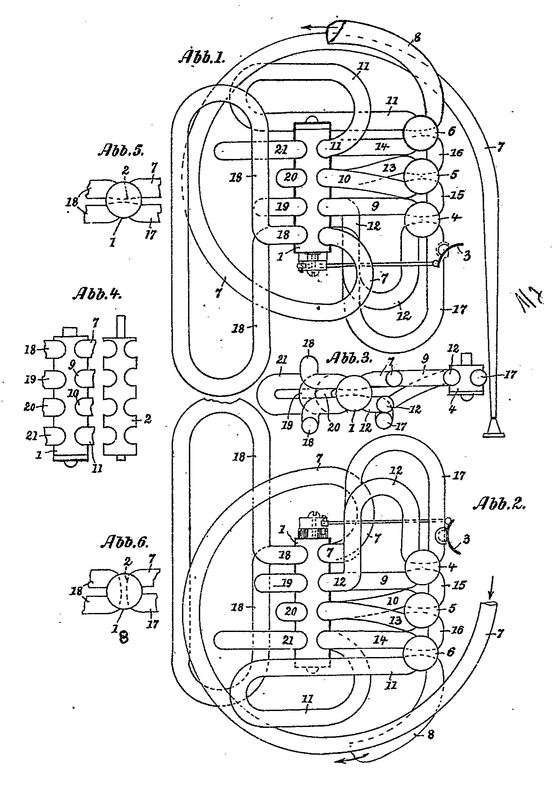 The two ports for each slide are arranged side-by-side along the length of the change valve which switches between the F and B♭ slides. The two other "stories" are for the F extension. The rotor of the change valve turns 120 degrees between the two sets of full-length F and B♭ slides. 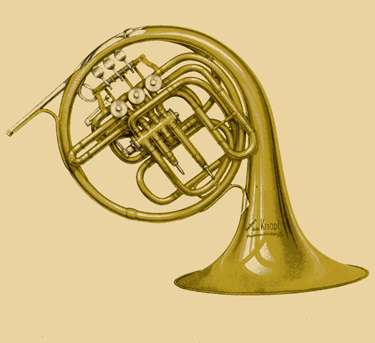 The advantage of this design over a full double horn is the lighter touch of single-story main valves instead of the two-story valves of the typical double. The disadvantages are that the second valve slide of the B♭ side is too short to be pulled for tuning, and the leverage and weight of the massive change valve rotor. 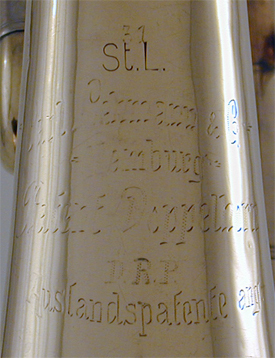 Nevertheless, this valve was used on horns, trumpets, and tubas as shown in the C.A. Wunderlich Catalog, ca. 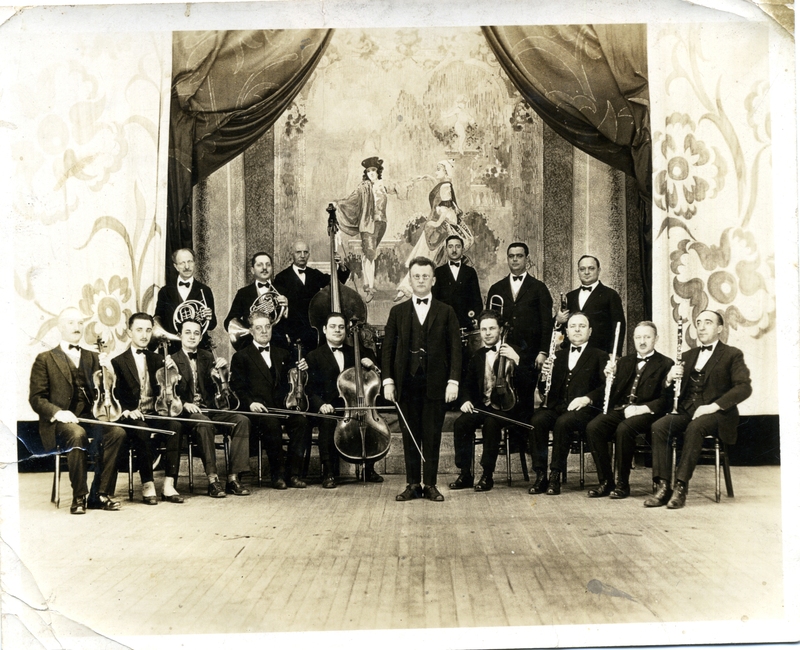 1935 (see below, left). Unidentified player in unidentified chamber orchestra with a Tiedt model horn probably by C.A. Wunderlich (see catalog illustration below, left). 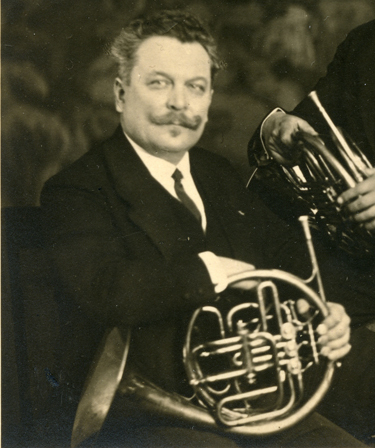 Sixteen years after Tiedt's patent, Carl Lehmann and Erdmann Chemnitzer received the patent for the change valve on the horn shown at the top of this page. 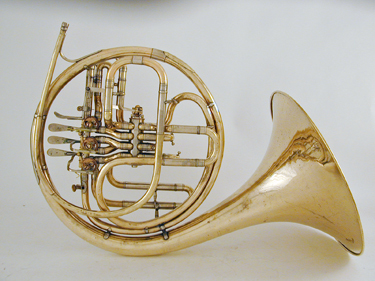 As on the Tiedt horn the main valves are single (one-story) rotors. Unlike Tiedt's patent, however, this valve is for a "compensating" double horn. 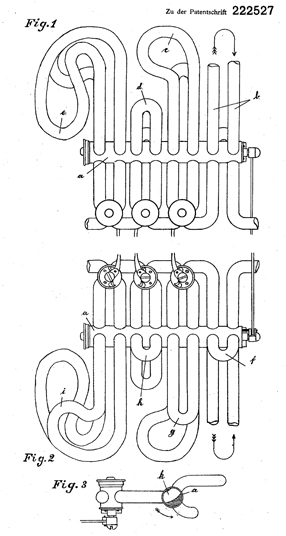 The ports are arranged on opposite sides of the instead of side-by-side, so it is only a four-story valve, half the length of the Tiedt valve (see diagram above right). 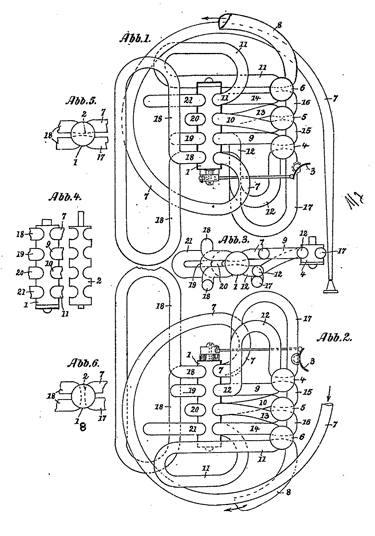 In this design the B♭ slides are located between the main valves and the change valve, with additional "compensating" slides for the F horn on the opposite side of the change valve. The change valve adds proportional supplemental tubing to the B♭ slides. 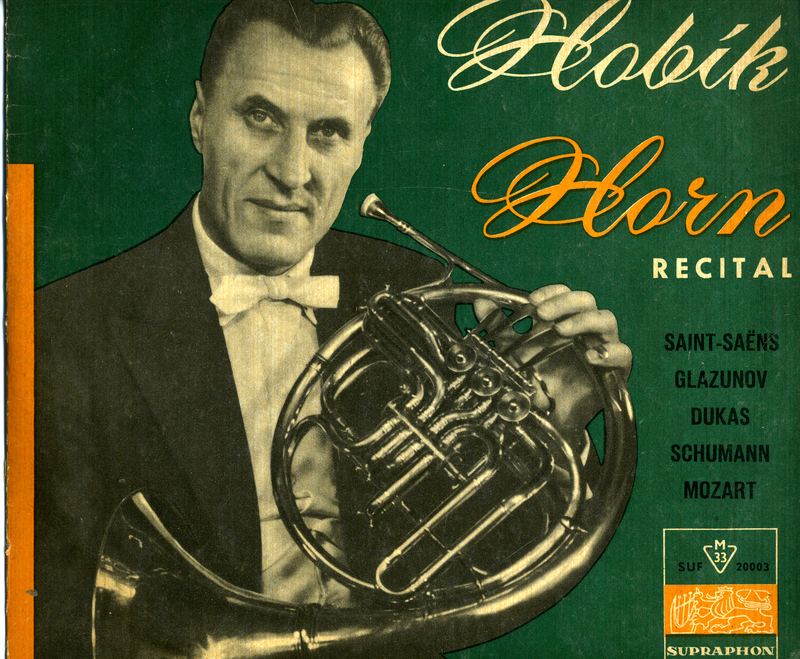 One advantage of a compensating horn is its lighter weight since tubing is shared between the F and B♭ slides. In comparison to the Tiedt change valve the rotor is also much lighter and only has to rotate ninety degrees. 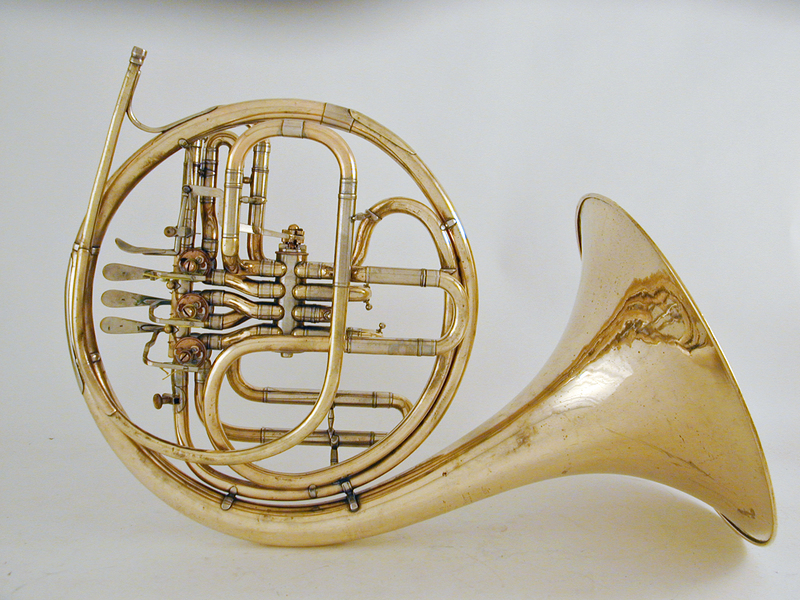 In addition to Carl Lehman & Co. horns of this design were also produced by the firms August Knopf3, Joesf Lidl, and other makers. On November 21, 1929 Kurt August Knopf received Gebrauchsmusterschutz (D.R.G.M.) 1099255 for a compensating double horn having a the usual three single valves, plus a fourth single valve coupled to a three-story walzen change valve (see the notice above and catalog illustration below right). The fourth valve replaces the fourth story of the Lehmann/Chemnitzer valve that switches the F-extension. According to Heyde this was a rather well-known Knopf model until 1945 but, since the switching was a little hard, it gradually fell into disuse after World War II. 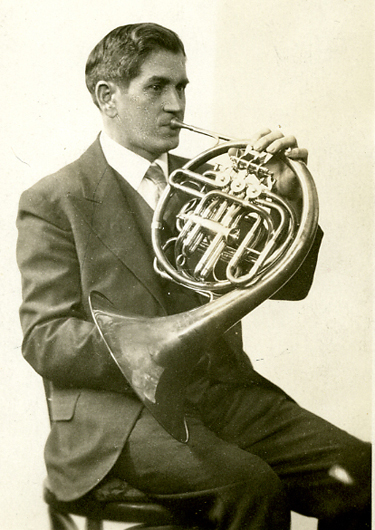 In the ultimate modification of the Lehmann/Chemnitzer model, August Dummuscheidt in Frankfurt (Main) received a patent (DRP 518837, May 11, 1930) for a compensating horn in which the walzen valve is replaced entirely with four single valves connected in tandem. In another variation, the Gebroeders De Prins in Anvers, Belgium patented and built the "Radio Wonder Hoorn" in which the three piston valves operated by a series of levers replace the single rotary valves. 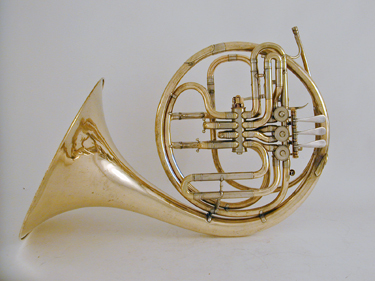 It is a compensating horn with the Lehmann/Chemninzer change valve. 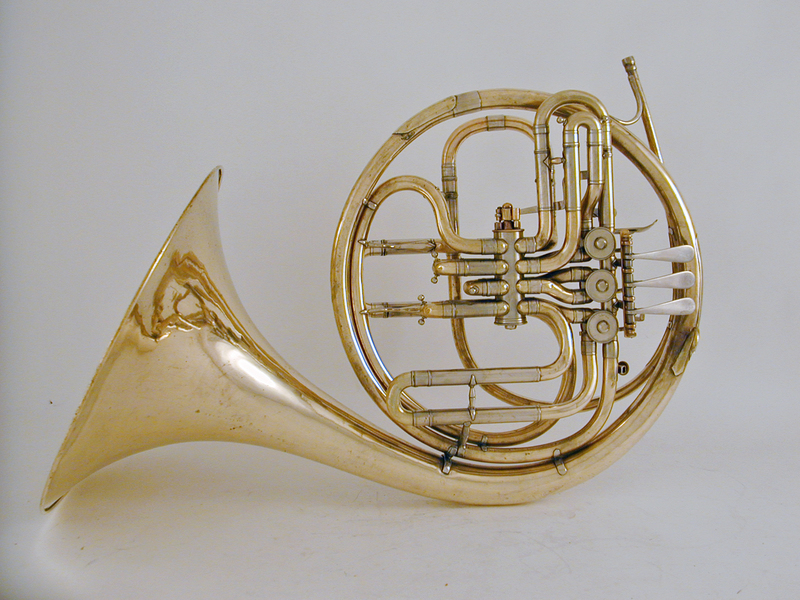 Chistopher Cornford has developed with Peter Steidle a compensating triple horn, which is marketed under the name: Mod. 3 S, incorporating a four-story Lehmann/Chemnitzer valve. Doppelhorn, Model III, in F-B oder B-F ineinander kombiniert gebaut, mit einfacher Maschine und langen Umschaltventil. Compare the above catalog illustration with the one shown below. 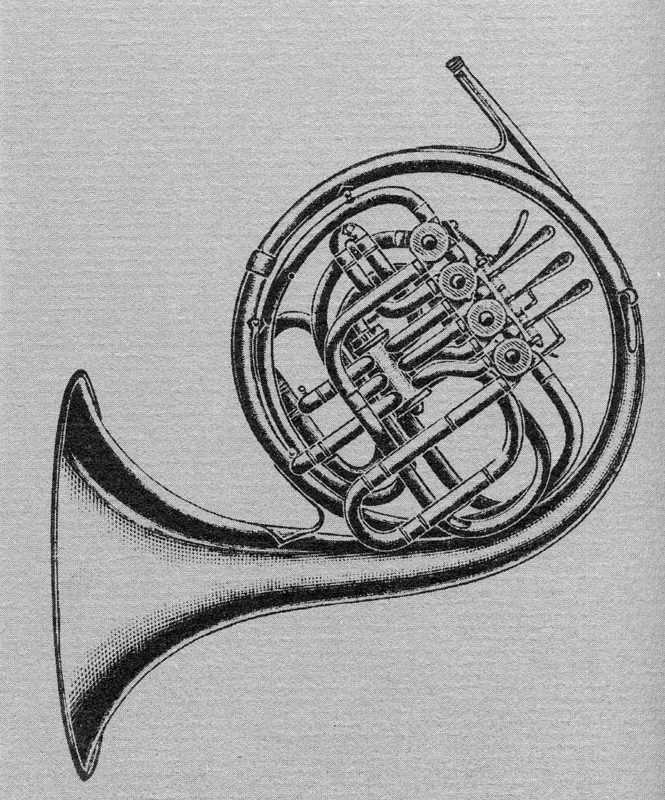 Three variations on the Lehmann Walzen horn are shown here. 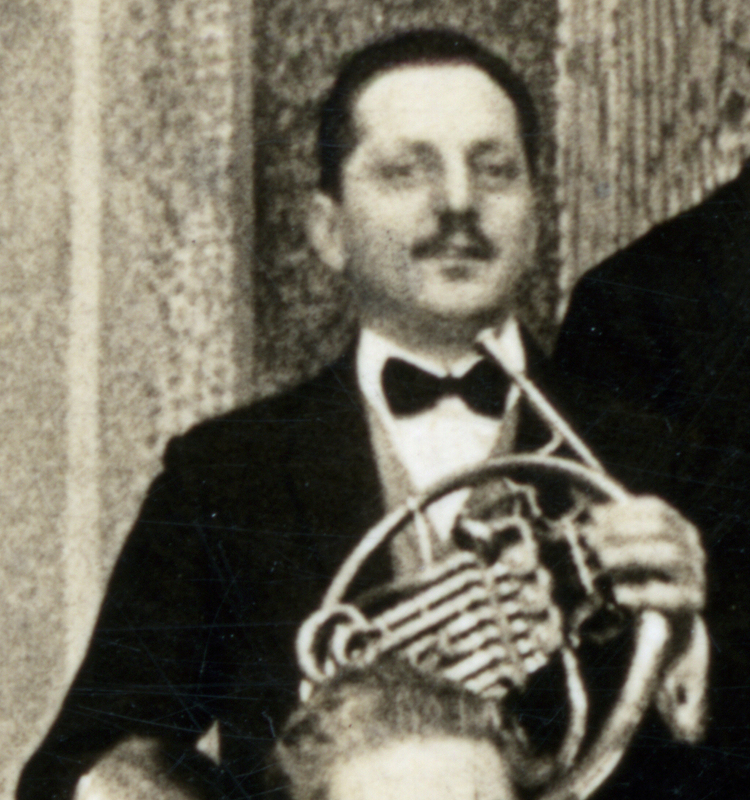 The horn that Josef Suttner (above left) is holding a Walzen horn probably made by August Knopf. 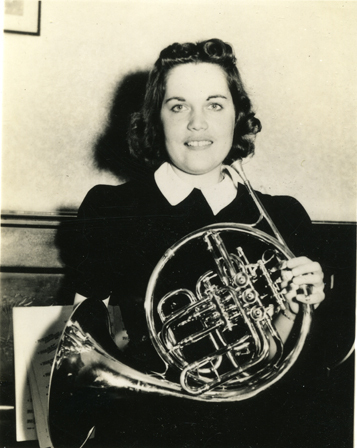 Helen Enser (above right) is holding a slightly different version probably by another maker, and her teacher and good friend of Suttner, Josef Franzl (right), is holding yet a third slightly different version, although the over-the-top valve lever linkage appears to be the same as that shown in the Knopf catalog illustration show above. 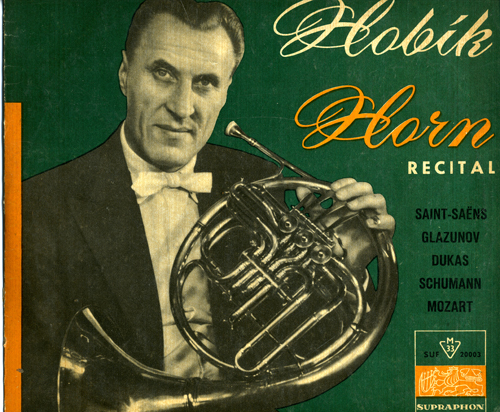 Below left, album cover of Josef Hobik, former principal horn in the Czech Philharmonic, Prague Radio Symphony, and Prague National Theatre Opera Company. 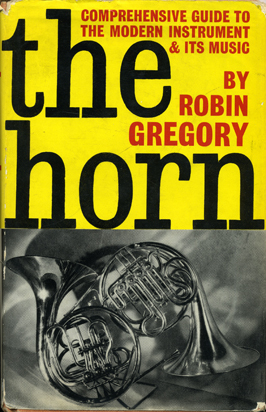 Below right, the dust cover of Robin Gregory's excellent book shows a Walzen horn. It is not identified in the text but appears to be the "Acustic" model by Josef Lidl. 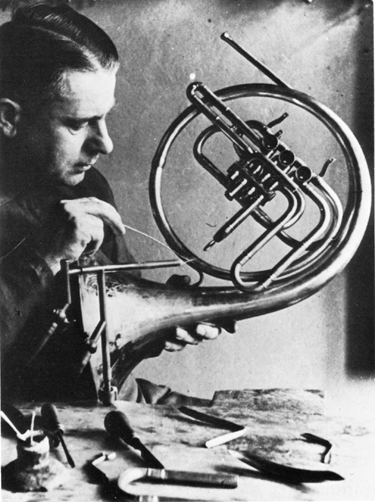 1.Carl Lehman was a brass instrument maker who flourished in Hamburg from ca. 1925 to ca. 1944. 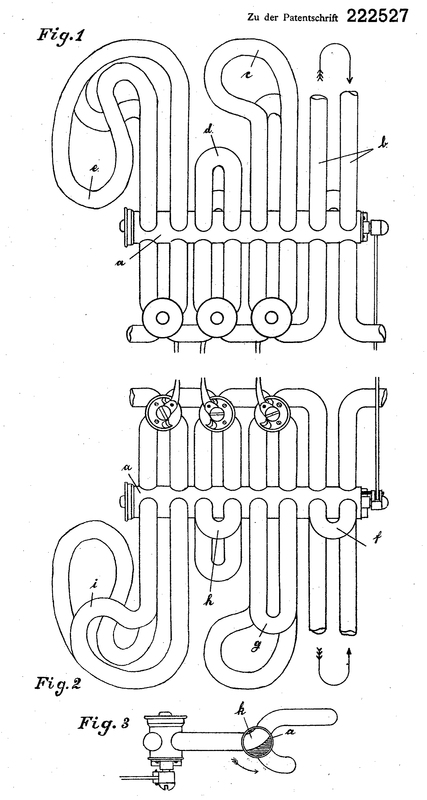 Deutsches Reich Patent 440308 for a Schaltventil für Blechblasinstrumente (Switching Valve for Brass Instruments) was issued jointly to Lehmann and Erdmann Chemnintzer on November 24, 1924 with subsequent foreign patents for the same valve design in Austria (107404, October 10, 1926), Great Britain (263460, December 30, 1926), France (622,226, February 21, 1927), and the United States (1,642,783, September 20, 1927). 3. See Brüchle and Janetzky (1976) plate 245 for a photo of an August Knopf compensating double horn in B♭ and F with the original Lehmann and Chemnitzer four-story walzen valve (ca. 1937) owned by Helmut Englert, Thanning, and plates 247 -251 for photos of Herbert Fritz Knopf showing steps in the process of making this model, ca. 1950.